Background In the operating room, factors such as interruptions, communication failures, team familiarity and the unpredictability of unplanned cases can prolong the length of an operation, and lead to inefficiency and increased costs. However, little is known about the extent to which such factors contribute to extending the expected length of an operation. Aim To describe factors that prolong the expected length of an operation. Methods Structured observations were performed on a purposive sample of 160 surgical procedures across 10 specialties of planned and unplanned surgeries. During the 6-month period, a trained observer structured observations. Bivariate correlations and a standard multiple regression model were developed to describe associations among unplanned operations, interruptions, prebriefings, team familiarity, communication failures and the outcome, and deviation from expected operation time. Results Of the three explanatory variables entered into the regression model, the only significant predictor of deviation in expected length of operation was the number of communication failures (p=0.013). This model explained 4.5% of the variance in deviation in expected length of operation (p=0.018). Conclusions The results of this study validate the role of prospective observational research methods in unveiling critical factors that contribute to deviation in expected length of operation. These results have the potential to inform evidence-based interventions aimed at ameliorating the effects of miscommunications, hence improve patient safety. The imperative to improve safety and quality while providing cost-effective operating room (OR) services creates both challenges and opportunities. Service efficiency and effectiveness is an important concern for many healthcare organisations—and this is especially pertinent in the OR given that this department generates approximately 42% of a healthcare organisation's revenue.1 It also represents a substantial amount of the organisation's expenses and resource demands. In the USA, it is conservatively estimated that OR utilisation costs are in excess of $15 per minute2; thus, any action that impedes workflow may concomitantly contribute to increased costs. Extended length of surgery can undermine planned patient flow in the OR, increase workload and subsequently lead to inefficiency, increased costs and length of stay for patients.3 The goal of the current study was to identify and describe factors that contribute to extending expected length of operation prospectively. To date, there has been limited research conducted that has measured the contribution of context-specific factors which may prolong the length of operation. In surgery, communication failures have been classified according to a taxonomy of communication episodes related to audience, occasion, purpose, content14–16 and experience.17 18 Audience refers to the participants present during the exchange; purpose refers to goals—unclear, not achieved or inappropriate; occasion refers to the timing of the exchange; content refers to the completeness and accuracy of the information exchanged; and experience refers to an understanding of the nomenclature and/or language, and verbal and non-verbal communication used in surgery.18 In one observational study, communication failures were observed in 30% of procedurally relevant exchanges, while 56% of these failures were linked to ‘occasion’.16 As a means of ensuring that critical information is exchanged in an opportune way to all team members, patient safety researchers have strongly advocated for the use of preoperative prebriefings in surgery. The patient safety literature abounds with exemplars of the contribution of preoperative prebriefings in enhancing communication between team members.13 15 19–21 A prebriefing is a deliberate and concise discussion performed by surgical, anaesthetic and nursing team members to facilitate person-to-person transfer of relevant information in real time.21 Prebriefings afford a platform to establish shared understandings, give team members permission to be candid, and enable a structure for collaborative planning.20 Thus, prebriefings facilitate a shared mental model of how the particular patient encounter will proceed. Other studies have sought to describe the sources of interruptions and their frequency of occurrence on team performance during surgery.3 4 22 Sources of interruptions have been classified according to the initiating source; conversational (eg, telephone, beeper), and procedural (eg, equipment malfunction). Healey et al's.4 observational study focused on case-irrelevant conversations across 50 general surgery procedures, and reported an average of 3.5 case-irrelevant conversations per procedure. Further, almost 50% of intraoperative communication consisted of ‘small talk’ and 25% of these communication exchanges involved another patient. In the same study, these researchers identified that equipment unavailability and failure necessitated that circulating nurses leave the room exacerbating intraoperative interruptions.4 In another observational study of 30 urology day cases, Healey et al22 identified that conversation, work environment problems, telephone calls and equipment problems were major sources of interruptions, and these interruptions had the greatest effect on surgical team performance. While much of the research surrounding interruptions in surgery has focused on quantifying the frequency and sources of interruption, there is little research that has extended these efforts in relation to measuring the cumulative impact of interruptions on the expected length of operation. The aim of this study was to describe factors that impact on the expected length of an operation. The hypothesised model underpinning this research was based on an extensive review of the patient safety literature and a series of qualitative studies around teamwork and communication in the OR.17 18 23–25 Previous research suggests that case complexity (eg, length of time, skills required), operations that are unscheduled (ie, unplanned semi-elective or emergency cases), with teams assembled ad hoc (ie, not dedicated/familiar) tend to experience more intraoperative events such as interruptions and miscommunications,3 9 22 26 all of which have the potential to extend the expected length of operation. For instance, a laparoscopic cholecystectomy with intraoperative cholangiogram may be anticipated to routinely take 45 min and ends up taking 90 min. We hypothesised that unplanned surgery, intraoperative interruptions, a lack of team familiarity, an absence of prebriefing and communication failures contributed to deviation from the expected length of operation. Length of operation, measured in minutes, was based on the time from skin preparation to the application of the final wound dressing. Deviation from expected length of operation (in minutes) was based on the observed length of operation minus the expected length of operation. Theoretical and operational definitions for each of the variables in this study are offered in the accompanying online appendix. The setting for this study was a large metropolitan teaching hospital in Queensland, Australia that caters for all surgical specialties except paediatrics, obstetrics and gynaecology. The operating suite has 22 commissioned ORs, and annually performs approximately 18 000 operative procedures. Following approval from the institutional ethics committees at the hospital and the university, consent for participation was obtained from medical and nursing participants working across anaesthetics and surgery. A purposive sample of 160 surgical procedures across 10 specialties of both planned (listed elective) and unplanned (out of hours) procedures was used to ensure maximum variation. During a 6-month period, structured observations and field notes were recorded on over 80 surgical teams. In this study, a surgical team consisted of an anaesthetic consultant and/or registrar, a surgical consultant and/or registrar, circulating nurse, instrument nurse and an anaesthetic nurse. The observer used a standardised data collection tool in table format with separate columns to insert data on predefined variables. Observational data were recorded in relation to length of operation, use of prebriefings and the personnel involved, type of interruption (ie, conversation or procedural), team member interrupted, number of interruptions and communication failures per case. The total number of communication failures and interruptions for each procedure was tallied. In some instances it was possible for a single miscommunication event (ie, occasion, audience, purpose, content, experience) and interruption event (ie, procedural or conversational) to be placed into more than one category. Therefore, the primary prompt of the communication failure and interruption was judged to categorise the event. Prior to study commencement, the data collection tool was piloted and frequent discussions held with the co-investigators to gain greater clarification of recorded events and refine coding. The credibility of an observational study depends on the experience and expertise of the observer. The first author, who has practiced extensively as an OR nurse, had observational research experience, and was trained in human factors, performed all of the 160 observations. To ensure consistency in documentation and interpretation, the observer was monitored by an experienced OR nurse who independently observed 10 cases. During testing of the tool in the field, co-observing with the second observer, ratings and categories were further clarified and refined, and consensus achieved. To ascertain team familiarity, the observer asked the senior nurse in the room about regularity, stability and length of time that individual team members had worked together before the start of each list or procedure. Throughout the operative procedure, the observer was positioned away from the OR table, with each member of the surgical team and all of the doors in view, ensuring an optimal viewing position. Field notes were recorded to give additional contextual information around the interactions and events that occurred during each of the 160 operative procedures observed. Data were collected over a 6-month period, representing about 500 h of observation. In this study, observed length of operation included the time from skin preparation to the application of the final wound dressing. Following the observational period, we asked senior surgeons from each of the surgical specialties for an expected length of operation for each of the cases observed across the 10 specialties (ie, time from skin preparation to application of the final dressing). Obtaining additional data based on the clinical experience of senior surgeons in their specialty reduced the potential for bias. Observational data were analysed using the statistical program Predictive Analysis Software for Windows (PASW Statistics V.18.0; IBM SPSS Statistics, Chicago, Illinois, USA). Data entry was checked for accuracy. Categorical data were dummy coded (0 = no, 1 = yes) and included after-hours procedures, team familiarity and prebriefings. The outcome, deviation in the length of operation was calculated based on the difference between the observed length and the expected length of operation. For descriptive results, absolute and relative frequencies were used to describe the number and type of miscommunications, the frequency of prebriefings, the personnel involved, and the number of interruptions and communication failures across surgical specialties. The number of intraoperative interruptions, communication failures, observed length of operation, expected length of operation and deviation from expected length of operation (in minutes) were measured as continuous variables. Across each surgical specialty, means and standard deviations were used to describe the expected, observed and deviation from length of operation. A model-building approach as described by Hair et al28 was used to construct a parsimonious model. First, simple linear regressions were used to assess bivariate relationships between individual predictors (ie, communication failures, intraoperative interruptions, team familiarity, unplanned surgery, prebriefings) and the outcome, deviation from observed length of operation. In the next phase of the analysis, only those variables that significantly correlated with the outcome were included in a standard multivariate regression model. The model was assessed in relation to variance inflation factors and tolerance levels and indicated an absence of multicollinearity. For inferential statistics, 95% CIs were computed and a p value of <0.05 was considered significant. The 160 procedures were observed across 10 specialties, with the mean observed length of operating taking 85.1 min (±111.8 min; range 975.0 min). Of these, 129 procedures (80.6%) were planned (ie, elective) and performed in hours. Across the 10 specialties, the mean expected length of operation was 63.7 min (±55.7 min; range 290.0 min) while the mean deviation from expected length of operation was 22.4 min (±87.0 min; range 960.0 min). With the exception of facio-maxillary and urology operations, the observed length of operation exceeded the expected length across the eight remaining specialties. Table 1 details the breakdown of the length of operation in relation to expected time, observed time, and the deviation from these times for each specialty. Of the 160 surgeries observed, 50 (31.3%) procedures were performed by dedicated teams—that is, surgeons, anaesthetists and nurses who consistently worked together on at least a weekly basis in particular lists. Figure 1 depicts the number of familiar teams with the corresponding number of operations observed in each specialty. In the 10 cardiac cases observed, all teams were established and had worked together consistently, while all of the 14 teams observed in facio-maxillary were assembled ad hoc. 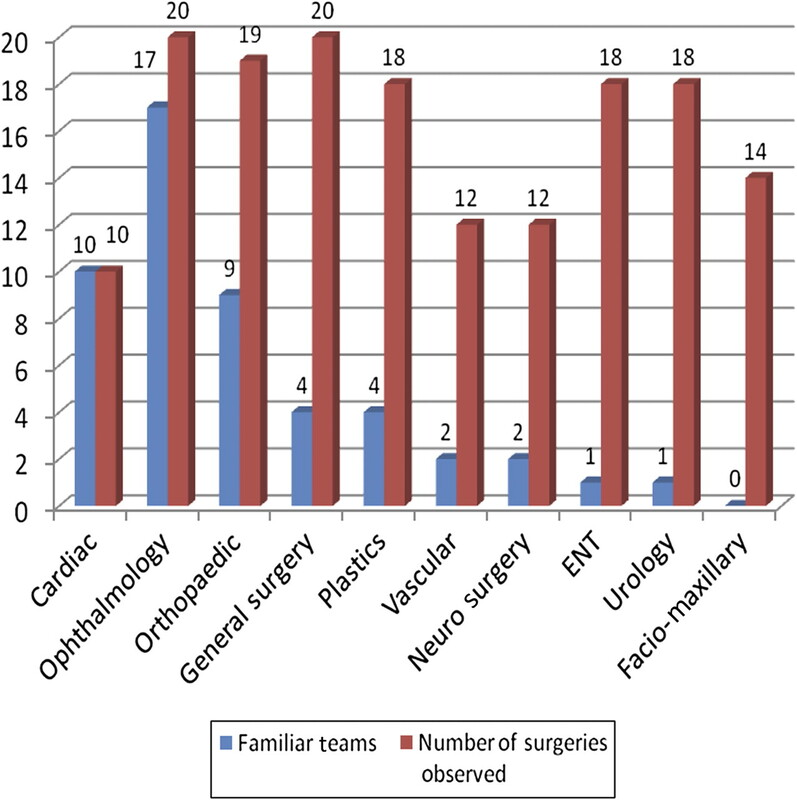 Number of familiar teams with the corresponding number of surgeries observed in each specialty (N=160). Preoperative prebriefings involving a representative from surgery, anaesthesia and nursing were observed in 20 (12.5%) of the 160 procedures. Of the 20 prebriefings observed, the primary surgeon was involved in the majority (n=18; 90%) while the circulating nurse participated in 11 (55%). ‘Other personnel’ (n=3; 15%) included resident doctors, medical students and nursing students. Figure 2 illustrates these results. Percentage of team members involved in prebriefings (across 20 surgeries). Communication failures occurred in 91 (57%) out of 160 surgeries. Across these 91 cases, a total of 175 communication failures were observed with a mean of 1.9 per case (±1.2; range 5). Across the 175 communication failures observed, the highest number of failures occurred in the experience category, with 54 episodes (30.9%), while the fewest occurred in the audience category, with 17 (9.7%). With respect to content, communication and information exchange between the operating surgeon and the instrument and circulating nurses were particularly vulnerable to ambiguity, loss or inaccuracy. In the purpose category, communications were predominantly participants' failure to achieve communicative objectives due to a lack of resolution of an issue raised. In relation to occasion, the context or the timing of the exchange was too late to be of maximum use—such as changes in the order of the operative list. Finally, in the audience category, communications most frequently involved the absence of a key team member during the exchange—most commonly the surgeon in relation to the preparation for surgery. Table 2 displays these results with accompanying definitions and exemplars (taken from field notes) in each communication category. 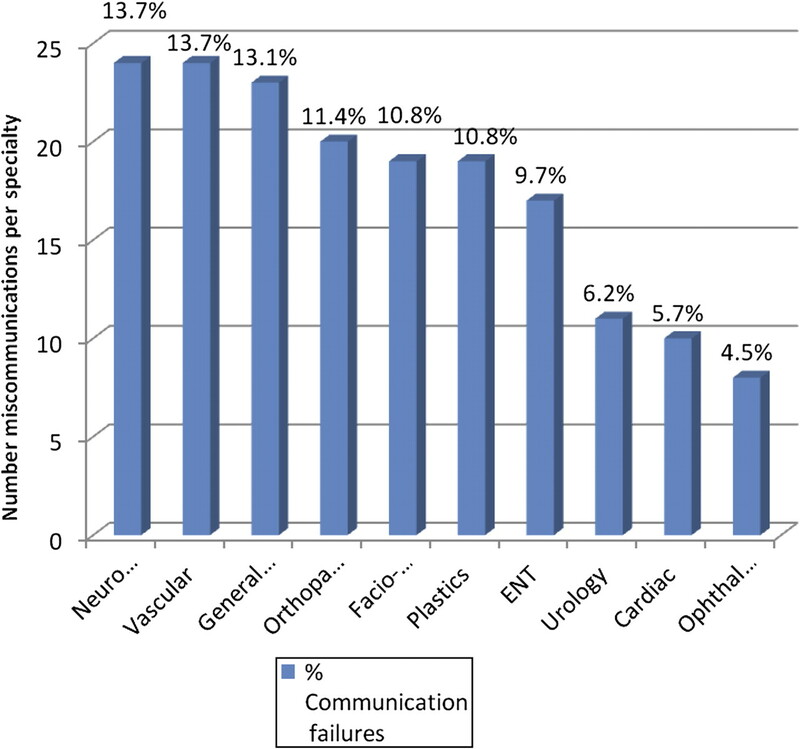 In relation to surgical specialty, the highest number of communication failures were observed in vascular surgery and neurosurgery, with 24 (13.7%), while the fewest were seen in ophthalmology, with 8 (4.6%). Of the 91 (55.8%) procedures in which communication failures occurred, just under half (n=43) experienced one communication failure; yet, during one case, six communication failures occurred. These results are presented in figure 3 and table 3. Percentage of communication failures per specialty (N=175). Of the 160 procedures, interruptions occurred in 107 cases (66.9%), with a total of 243 interruptions observed across these operations. Of the 107 cases characterised by interruptions, conversational interruptions occurred at least once in 74 cases (69.1%) while procedural interruptions occurred at least once in 71 procedures (66.3%). Across all 107 cases, the mean number of interruptions per case was 2.3 (±1.6; range 8). Simple linear regression was used to assess the bivariate relationships among communication failures, intraoperative interruptions, team familiarity, unplanned surgery, prebriefings and the outcome, and deviation from the observed length of operation. There were no statistically significant relationships between unplanned surgery (p=0.803), prebriefings (p=0.717) and the outcome. The three remaining explanatory variables were simultaneously entered into the regression model, and explained 6.3% of the variance in deviation from expected length of surgery (adjusted R2=0.045, p<0.0001). The number of miscommunications was the only variable to contribute to deviation from the expected length of operation (β=0.213, p=0.013). Table 4 details these results. We performed a prospective observational study to describe factors that contributed to deviation from expected length of operation; and as such, this work extends the earlier work of others who have described the parameters of team performance in surgery.3 15 16 22 To our knowledge, the present study is also one of the largest single observational studies in this field. In this study, the mean observed length of operation across all specialties was 85 min, yet the mean expected time reported by senior surgeons was 64 min—a difference of 20 min. To this end, we used the mean difference between observed and expected length (time deviation) as the outcome to reduce potential bias. Our results suggest that communication failures in the OR contribute to increasing the expected length of operation. That communication failures predicted deviation in length of operation after controlling for interruptions and team familiarity is a significant finding. Given that longer operations across all specialties are considered more complex and specialised, it is intuitive that teams may naturally experience more miscommunication episodes. Notably, ophthalmology operations were the shortest in duration while cardiac cases were the longest. Our results indicated that cardiac and ophthalmology teams also had the fewest number of communication failures. In the cardiac room, closed loop communications29 (ie, feedback sent to the receiver is subsequently confirmed by the sender) were observed between the surgeon and perfusionist during cardioplegia and subsequent bypass. Throughout the majority of the procedure the surgeon is focused on the manual manipulations of the patient's chest and heart, while the perfusionist is primarily focused on the functioning of the heart–lung bypass machine. Therefore, each has access to information the other does not; the surgeon has visual access to the surgical field, and tactile information about the compliance of the patient's cardiac tissue, while the perfusionist has access to the various displays and controls not visible to the surgeon. Communication between the surgeon and the perfusionist is crucial at this juncture as it serves to coordinate the joint activity of cardioplegia management, which occurs during critical periods when the patient's heart is at rest. Our results did not support a relationship between team familiarity and deviation from expected length of operation. This result is somewhat surprising given the emergent evidence around the role of teamwork in enhancing team effectiveness in surgery.3 9 39 It is important to emphasise that the cardiac room we observed was a cohesive unit where there appeared to be greater specialisation, dedicated staff, scheduled periods of activity, with a small number of well rehearsed types of cases, and clearly defined team roles and functions. This team stability and routine was often in stark contrast with other surgical specialties we observed in which team members (ie, nursing and anaesthetic) were transient and less experienced (ie, ENT, urology). There is increasing evidence to support the notion that dedicated teams have greater opportunity to develop shared mental models because they are better equipped to adapt their behaviours in accordance with their expectations of their colleagues' actions across a myriad of situations.11 29 Nonetheless, in this study the observed use of closed loop communications in the cardiac room likely contributed to using a shared mental model. In our study there was no relationship between out of hours surgery and deviation from expected length of operation. This result is quite unexpected, given that after-hours surgery is frequently performed by teams that are assembled fortuitously because of rostering arrangements, staffing constraints with limited consideration for skill mix. Still, a larger sample of out of hours surgeries are likely required to detect a statistically significant result. Nevertheless, we observed occasions (recorded in field notes) in which individuals conveyed information to others in a deliberate and focused manner in order to make the implicit, explicit. For instance, in preparing for an after-hours neuro case, the instrument nurse, who had not previously met or worked with the consultant surgeon, introduced herself and while showing him the equipment for the case, enquired about his particular preferences for sutures and craniotomy instruments. Throughout the procedure, the instrument nurse asked appropriately timed and relevant questions of the surgeon which allowed her to anticipate in advance what he would need for the next steps. The act of seeking further information and clarification in this circumstance, when the operation is perhaps more complicated, likely maximised the understanding the instrument nurse and the primary surgeon shared. These preemptive behaviours by the nurse in this scenario also suggest that she may have a partially developed mental model. This prospective study has several limitations that must be acknowledged. First, our sample of 160 surgeries, while considered large for an observational study of this nature, was drawn from a single hospital site that may differ to other public hospitals. However, this hospital is typical of many large metropolitan tertiary institutions. Second, the measures used in this study depend on the observer's capacity to interpret events and as such, may differ from person to person. Notwithstanding this, the first author performed all 160 observations, was conversant with the OR context, trained in human factors and observational research, and was validated by another observer. Further, in development and measurement of the constructs used, we used definitions that were underpinned by previous research and were observable.25 33 Third, the amount of explained variance in deviation from expected length of operation was small, albeit that it was statistically significant. Thus, a substantial proportion remains unexplained, indicating the presence of other unknown predictor variables. Yet, that the number of communication failures contributed to lengthening operative time in this sample is an important finding that warrants further exploration. Finally, our study has described the relationship between deviation from expected length of operation and some of its predictors; there was no attempt to collect patient outcome data. Length of stay or mortality data may be collected for future work. There is likely an associative path between communication practices, systems processes and patient outcomes—notwithstanding, a much larger sample is needed to demonstrate such an association. Despite these limitations, these results have the potential to inform the development of evidence-based interventions specifically designed to augment team cohesion and understanding. The findings of this study have brought into sharper focus factors that potentially prolong the length of operation. Communication failures in the OR will never be eliminated completely; however, the goal should be to recognise and mitigate their effects. Not only are communication practices amenable to change, but the influence of such changes may be considerable given the central role of team communication in cultivating—or compromising—safe and effective clinical practice. The next step in our line of enquiry is to design and evaluate strategies that may ameliorate the effects of miscommunication in the OR environment. The research team is grateful to the staff working in the OR of the study site for their willingness to participate in the study and their openness to the presence of BG in the theatres. HFMA Executive Roundtable. Improving OR throughput: Real World Successes and Challenges. Washington DC: HMFA, 2004.
. Economic, educational, and policy perspectives on the pre-incision operating room period. Anesth Analg 2006;103:919–21.
. Disruptions in surgical flow and their relationship to surgical errors: an exploratory investigation. Surgery 2007;142:658–65.
. Defining the technical skills of teamwork in surgery. Qual Saf Health Care 2006;15:3.
. Training teams for the perioperative environment: a research agenda. Surg Innov 2006;13:170–8.
. Operating room teamwork among physicians and nurses: teamwork in the eye of the beholder. J Am Coll Surg 2007;202:746–52.
. Error, stress and teamwork in medicine and aviation: cross sectional surveys. BMJ 2000;320:745–9.
. Team communications in the operating room: talk patterns, sites of tension, and implications for novices. Acad Med 2002;77:232–7.
. Behavioural markers of surgical excellence. Saf Sci 2003;41:409–25.
. Shared mental models enhance team performance. Nurs Crit Care 2009;14:222–3.
. Does team training work? Principles for health care. Acad Emerg Med 2008;15:1002–09.
. The influence of shared mental models on team process and performance. J Appl Psychol 2000;85:273–83.
. Improving teamwork climate in operating theatres: the shift from multiprofesisonalism to interprofessionalism. J Interprof Care 2006;20:461–70.
. Getting teams to talk: development and pilot implementation of a checklist to promote interprofessional communication in the OR. Qual Saf Health Care 2005;14:340–6.
. A theory-based instrument to evaluate team communication in the operating room: balancing measurement authenticity and reliability. Qual Saf Health Care 2006;15:422–6.
. Communication failures in the operating room: an observational classification of recurrent types and effects. Qual Saf Health Care 2004;13:330–4.
. Education and experience make a difference: results of a predictor study. AORN J 2011;94:78–90.
. Operating room culture—implications for nurse retention. West J Nurs Res 2008;30:259–77.
. Enhancing communication in surgery through team training interventions: a systematic literature review. AORN J 2010;92:642–57.
. Operating room debriefings. Jt Comm J Qual Patient Saf 2006;32:407–10.
. Bridging the communication gap in the operating room with medical team training. Am J Surg 2005;191:770–4.
. Quantifying distraction and interruption in urological surgery. Qual Saf Health Care 2007;16:135–9.
. The impact of organisational and individual factors on team communication in surgery: a qualitative study. Int J Nurs Stud 2010;47:732–41.
. Why isn't time out being implemented? An exploratory study. Qual Saf Health Care 2010;19:103–6.
. Operating theatre nurses' perceptions of competence: a focus group study. J Adv Nurs 2009;65:1019–28.
. Perioperative workflow: barriers to efficiency, risks, and satisfaction. AORN J 2008;87:187–208.
. ‘Power Analysis for Multiple Regression,’ free calculator (online software). Fullerton, CA, 2010. http://www.danielsoper.com/statcalc3/.
. Multivariate Data Analysis. 6th edn. New Jersey: Prentice-Hall, 2006.
. Safety at the Sharp End: A Guide to Non-technical Skills. Surray: Ashgate, 2008.
. Situational awareness in medicine. Qual Saf Health Care 2006;15:284.
. Situational awareness in medicine. Qual Saf Health Care 2006;15:384.
. Surgeon information transfer and communication factors affecting quality and efficiency of inpatient care. Ann Surg 2007;245:159–69.
. Using the Communication and Teamwork Skills (CATS) assessment to measure health care team performance. Jt Comm J Qual Patient Saf 2007;33:549–58.
. Towards safer interprofessional communication: constructing a model of ‘utility’ from preoperatvie team briefings. J Interprof Care 2006;20:471–83.
. Analysis of errors reported by surgeons at three teaching hospitals. Surgery 2003;133:614–21.
. Assessing team failures in operating rooms and intensive care units. Qual Saf Health Care 2007;16:5.
. Speaking up in the operating room: how team leaders promote learning in interdisciplinary action teams. J Manag Stud 2003;40:1419–52.
. A common body of care: the ethics and politics of teamwork in the operating theatre are inseparable. J Med Philos 2006;31:305–22.
. A prospective study of patient safety in the operating room. Surgery 2006;139:159–73. Funding This work was supported by Griffith University New Researcher Grant and the Research Centre for Clinical and Community Innovation. Ethics approval Griffith University & Princess Alexandra Hospital HREC. Data sharing statement The data obtained in this study are the property of the principal researcher and first named author.